Welcoming the Stranger is 20 years old! On February 1, 1999, our founder, Sturgis Poorman, began an ESL class to support immigrants in Lower Bucks County. He felt a calling to help welcome the stranger in a new land. The one class quickly grew into several classes that encompassed ESL (English as a Second Language), Computer Skills, and Citizenship Preparation. Immigrants often tell us that they feel stunted and frustrated when they first come to the country; after all, they are competent, intelligent people who just do not know the language or culture yet. Learn about the journey of one of our students, Patricia, who began with Welcoming the Stranger as a student, helped us a volunteer, and is now our part time Administrative Assistant, fielding phone calls and emails from dozens of students each week and helping us to build capacity as our student enrollment continues to dramatically increase. Want to have even more of an impact? Join our 20/20 Fundraising team! In honor of our 20thbirthday, we challenge 20 of you (more are welcome!) to ask 20 of your friends for “microdonations” for Welcoming the Stranger through the month of February! We are seeking 20 people to sign up to each ask 20 of your friends to donate a microdonation (a small amount) to benefit WTS. We understand that not everyone is able to afford a large donation, but many people donating $5, $10, or $20 at a time can make a huge impact. If 20 of your friends donate at least $10 each, you would raise $200 (20x10=200). If all 20 of us can each raise $200, then that equals $4,000, which covers the cost of one class for half a term! This initiative also spreads the word about our work to a greater audience, reaching those who may need our services as well as those who may want to support us. Can you help us make new friends for our 20th birthday? But I’m not a fundraiser, you might think! How do I go about participating in this challenge? There are several simple ways you can participate. You can make a Facebook fundraiser (we will send you instructions), or you can send an email out to your friends (we will send you a template). Check back to this page throughout the month of February (and the rest of the year!) for more memories, features, and ways to get involved in our birthday celebration! Boy Scouts and Doylestown teachers joined Welcoming the Stranger students and families from Salem UCC to share fun at the local branch of the public library. They played bingo and happily received library cards to enable them and their children to borrow books and all the things available in our amazing Bucks County libraries. The library organizes tours and provides rooms for activities and programs. The scouts also learned some Spanish while they interacted and helped the ESL students become familiar with the library. 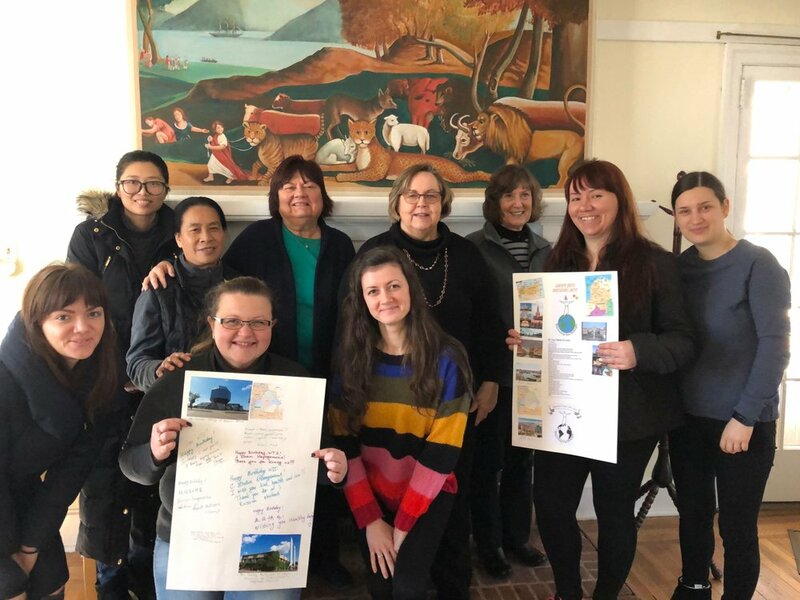 Students in the Doylestown ESL class enjoyed learning about ways to get involved in their local community and get their children involved as well. Feeling like a part of the community and knowing how to utilize resources is an important part of establishing life in a new country. On February 14, the students in the Morrisville Conversation Class learned about the history of Valentine’s Day as well as the history of Welcoming the Stranger. We had fun with the heteronyms of the day, “The soldier decided to desert his dessert in the desert,” and discussed “pneumonic devices” to help us remember things like spelling details. Dessert has two s’s because we like desserts, and we want an extra! We practiced idioms related to Valentine’s Day. For example, we learned “his heart is in the right place,” and “she wears her heart on her sleeve.” In our small groups, we discussed how Valentine’s Day is celebrated in their countries of origin. We were surprised to learn that the equivalent of Valentine’s Day is celebrated on June 12th in Brazil. We also discussed “What Welcoming the Stranger” means to me. We summarized by writing phrases on a Valentine for Welcoming the Stranger. And we completed the day with a little Valentine’s celebration. Everyone was “feeling the love” by the end of our class. Nowadays there are many fictional characters that exemplify girl power; they are self-aware, independent, decisive, balanced, and responsible, advocating for themselves and others. We, however, do not need to look very far to find a real life young woman that embodies these traits. Her name is Melanie Nolan. She is a senior at Pennsbury High School, and for the past two years, she has volunteered for Welcoming the Stranger as an ESL (English as a Second Language) tutor in our Levittown and Morrisville evening classes. Melanie has demonstrated that she is a natural teacher from the start. She is proficient in speaking and writing English, a good listener, and adept at explaining things in more than one way. She frequently enhances her instructional materials by creating entertaining doodles on the board. On Monday and Wednesday nights Melanie can be seen smiling, laughing, speaking, and intently listening to adult students from all over the world; the majority are two and three times her age. She is consistently calm, patient, respectful, empathetic, and understanding to those she tutors, creating a welcoming learning community where students can be comfortable, confident, and successful. During Welcoming the Stranger’s 20th year of service, we are absolutely delighted and proud to share that Melanie Nolan’s service to the community and her embodiment of girl power is being recognized by the Bucks County YWCA; she is the recipient of this year’s #Girlpower Award and will be honored at the 28th Annual Women Who Make Difference Awards Dinner on May 16. This Welcoming the Stranger volunteer is truly dedicated to making a difference in her community, and we eagerly anticipate her future endeavors. Students in the Bensalem Citizenship Class were recently studying the legislative branch of the U.S. Government. 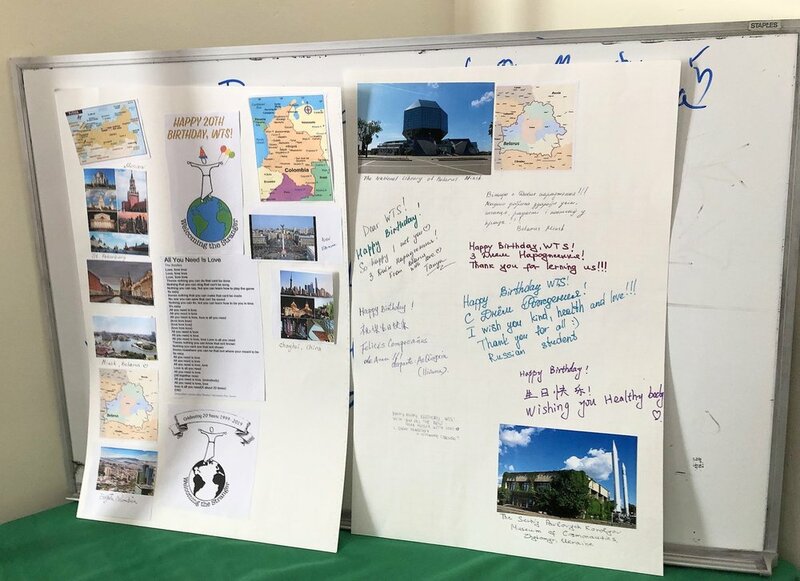 Students and teachers celebrated WTS’s 20th Anniversary with a little party and made a card for WTS that included pictures, some of which the students brought in from their countries of origin, and best wishes written by all. My name is Shilin, and I am 76 years old this year. I am from CHINA. I am very lucky to attend the English class supported by WTS (Welcome The Stranger). Thank you very much for all teachers' hard work. In two months of learning , I learned a lot. Before I attended this class, I didn't dare to talk to other people, and now I 'm not afraid of talking. However, because my listening is very poor and the English words that I know are very few, so there are many difficulties in learning. I will try to improve my listening ability. In the future I will also try my best and study very hard in learning English well. Thanks all teachers and especially thanks teacher Becky for her tremendous help and very patient teaching.